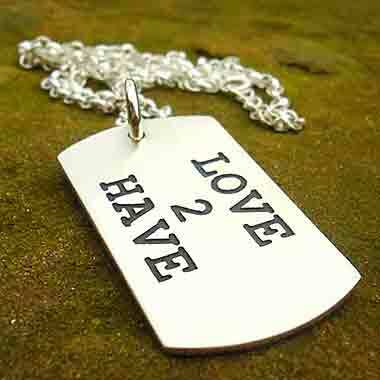 MEN'S NECKLACES : BRITISH Made : LOVE2HAVE in the UK! The Best! 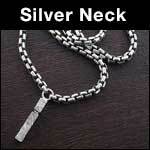 British made unusual men's necklaces all handmade in the UK at prices you can afford. Fully guaranteed and returns accepted. OK, guys, at Love2have medallion man is dead; instead, we have the modern urban man. Men's jewellery has come on a lot since those days. 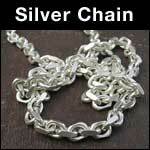 It's not about how many or how heavy the chains are today, but does it have style, individuality, and taste? Have we got some stunning pieces for you! Silver has always been popular for men's necklaces and men's pendants, and indeed, there has been a significant rise in the popularity of oxidised silver for that urban or dare we say Gothic look. Oxidised silver jewellery is no longer the preserve of the heavy metal rockers. Firm favourites are always pendant like silver tags such as the 'Army Camouflage Necklace' along with bullets, spikes and not least of all the gorgeous silver combination pieces with their distressed textured surfaces. Also check out the truly knock out 'Panther Skull Necklace', beautifully sculpted with an articulating jaw. 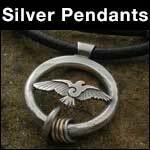 All of these men's necklaces are handcrafted here in the UK demonstrating great British craftsmanship. 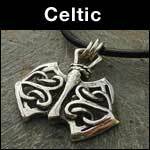 We have a big range of rubber and silver jewellery, and most of our pendants come supplied on either this or a silver chain. Neckpieces look better when worn close around the neck, whereas pieces on silver chains are usually designed to hang around the neck. So it's official, medallion man is dead, long live urban man in this new age of men's jewellery.